Audi TT – an update for the design icon. 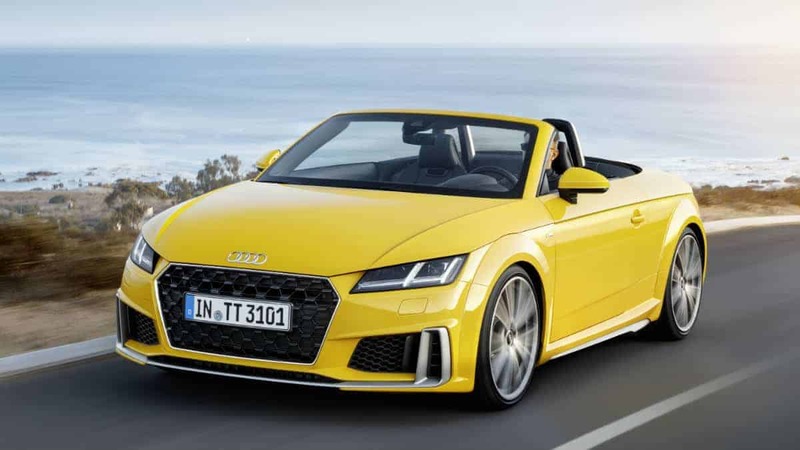 Twenty years after the series premiere of the original TT, the third generation of the Audi TT is receiving a comprehensive update. The design icon takes the stage with a sporty and refined exterior design, higher-powered engines and an extended scope of standard equipment. Design elements underline its dynamic appearance, new seven-speed S-tronic delivers sporty performance, a comprehensive range of standard equipment improves the driving experience. The first generation of the Audi TT made its series premiere in 1998. Three years before, Audi had already presented the TT as a concept car – a Coupé was shown at the IAA in Frankfurt and a Roadster was presented at the Tokyo Motor Show. Within a short time after the market launch, the TT Coupe had moved to the top of the segment. The Audi TT stands for driving a pleasure, design and close attention to detail: aluminum elements in the driver-oriented interior, progressive rim design, a short, ball-shaped gear lever knob, characteristic tank flap and round, dual-branch tailpipes are among the typical features of this compact sports car. The design with its incisive geometric forms has fans all over the world. 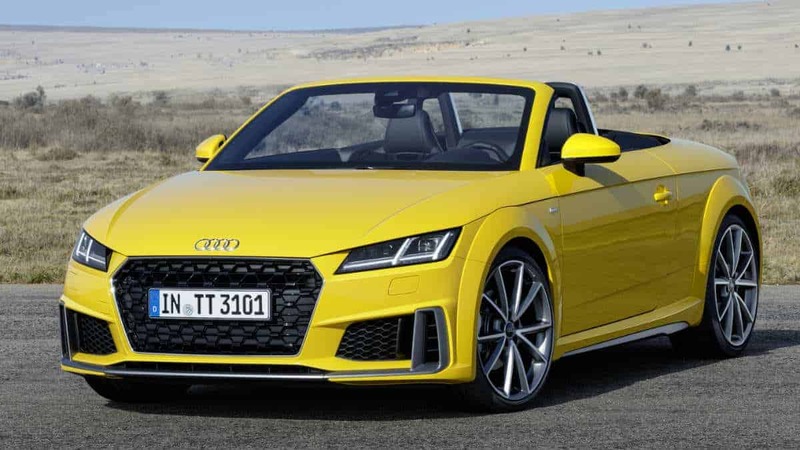 Right on time for the 20th anniversary of the first Audi TT, the brand is especially highlighting the sports car character of the new model. Audi has accordingly refined the design of the new TT, enhanced its performance and extended the range of standard equipment. Besides the driver-oriented Audi virtual cockpit, the basic version of the new model now features the Audi drive select dynamic handling system, a rain and light sensor, heated exterior mirrors and the multifunction steering wheel plus, with which the infotainment and voice control system can be controlled entirely using the steering wheel. Also standard are the illuminated USB ports as well as Bluetooth for a wireless pairing of devices. More masculine, more progressive and even sportier than before – the exterior design of the new TT. The front features a three-dimensional Singleframe radiator grille. Large side air inlets emphasize width even in the basic version. 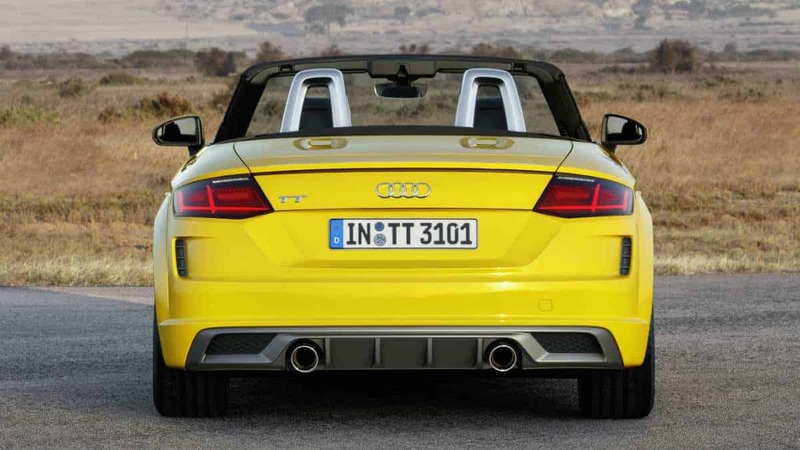 At the rear, horizontal lines again underscore the width of the new Audi TT. There is no cap underneath the tank flap with its classic TT design; the driver can insert the gas pump nozzle directly into the opening – a typical sports car feature. Headlights with LED or Matrix LED technology are optionally available. The dynamic turn signals are a visual highlight here. 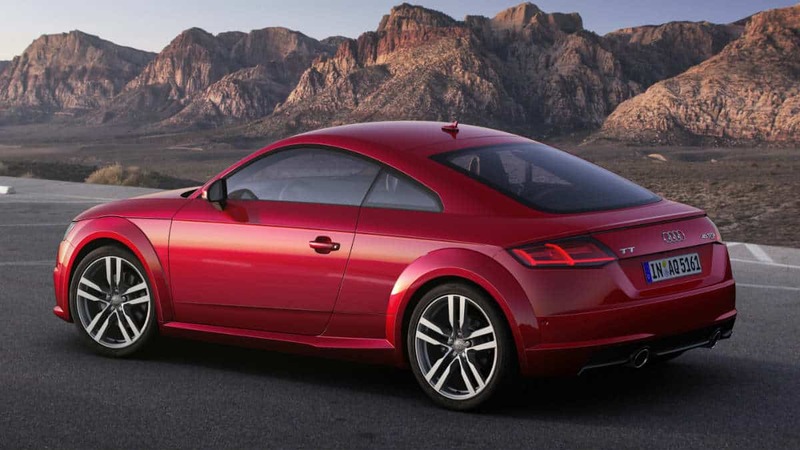 The new designed, optional S line exterior package underscores the sporty character of the Audi TT even more. It includes a full-length front splitter, vertical air inlets, a radiator grille in titanium black and specific side sills with inserts as well as a sporty rear end. Added is a wider diffuser and vertical air inlets below the rear lights with three horizontal fins each. The TT Coupe and the TT Roadster are each 4.19 meters (13.7 ft) in length. Both body variants have short overhangs; their wheelbase measures 2.51 meters (8.2 ft). The new TT leaves the factory on 17-inch wheels; Audi and Audi Sport optionally offer 18, 19 and 20-inch wheels. Three new colors complete the range of paint finishes: cosmos blue, pulse orange and turbo blue (S line only). For the new TT, Audi has a range of petrol engines in various performance levels, paired either with the six-speed manual transmission or a seven-speed dual-clutch transmission. In both transmission variants, the close-ratio lower gears enable powerful acceleration, while the wide ratio of each transmission’s highest gear keeps the engine speed down. All new engines come with a gasoline particulate filter. 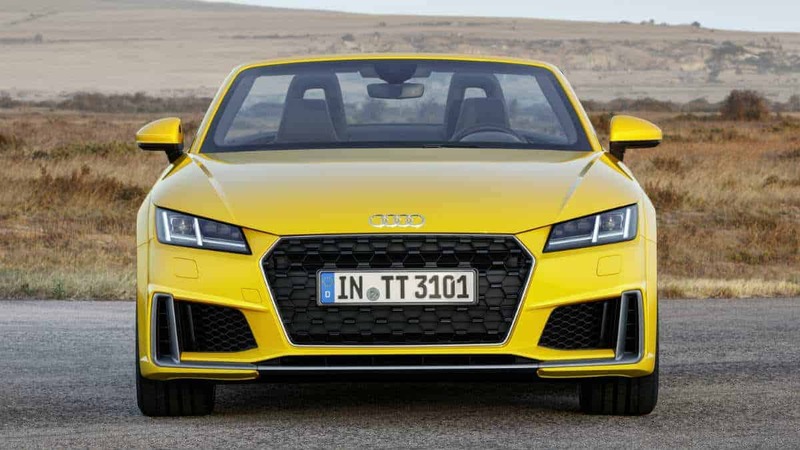 The new Audi TT offers handling that is both dynamic and precise. If the customer chooses the S line sports package or Audi magnetic ride, the body is lowered by ten millimeters (0.4 in). Other chassis highlights include progressive steering, four-link rear suspension and Electronic Stabilization Control (ESC). The wheel-selective torque control is activated in fast cornering and improves handling as required by means of precise brake interventions on the unloaded wheels on the inside of a curve. The sports car character is also underscored by the driver-oriented interior with its clear lines. The slender instrument panel resembles an aircraft wing; the round air vents with integrated controls allude to jet engines – a classic TT detail. Sport seats with integrated head restraints are standard on the Audi TT. S sport seats (standard in the S line sport package) with pneumatically adjustable side bolsters are optionally available. The luggage compartment of the 2+2 seater affords 305 liters of space (10.8 cu ft) underneath the stretched tailgate, while the Roadster offers 280 liters (9.9 cu ft). All indicators appear in digital form on the 12.3-inch display of the Audi virtual cockpit. The driver can choose between two modes: in the classic view, the speedometer and tachometer take center stage. In “Infotainment” mode, content such as the navigation map is enlarged. The new sport display is optionally available and provides information on the engine output currently in use, as well as the torque and g-forces. The MMI terminal on the center console has just six keys. The top-of-the-line MMI navigation plus with MMI touch integrates a touchpad on the upper surface of the rotary/push-button control that recognizes handwritten input and allows zooming, for example. The voice control system understands formulations from everyday speech. Audi connect brings various online services on-board via fast LTE. The Audi smartphone interface connects smartphones with the car and can stream content seamlessly to the Audi virtual cockpit via USB. The high-end solution when it comes to hi-fi systems is the Bang & Olufsen Sound System. Its amplifier offers 680 watts of performance and a total of 14 channels. It fills the interior using twelve speakers, including two center speakers and two bass boxes. The driver assistance systems embody the TT philosophy: they relieve the driver of work, so that he or she can fully concentrate on the road. The line-up extends from the lane change assist Audi side assist, the lane departure warning system Audi active lane assist and traffic sign recognition to the park assist with display of the surroundings and a rearview camera. 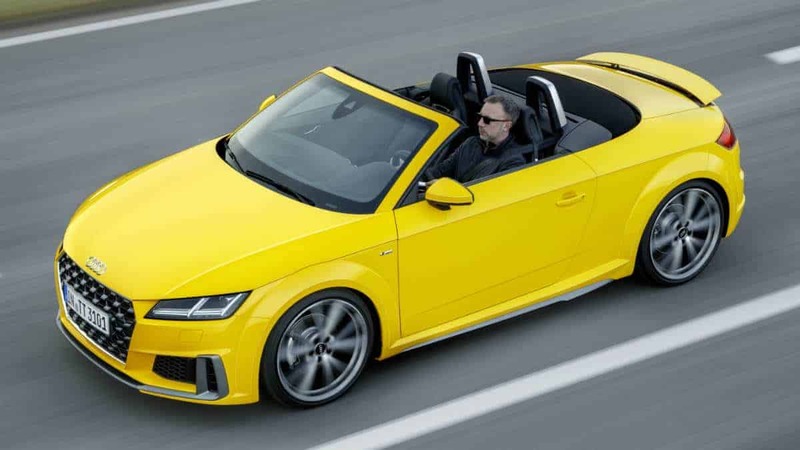 Like every open-top Audi, the new TT Roadster comes with a soft top in either black or gray. The soft top has a taut fit, and its excellent sound insulation makes it an “acoustic top.” With a weight of 39 kilograms (86.0 lb), the top is very light and doesn’t compromise the luggage compartment. A standard feature, the electrical drive opens and closes the top in around ten seconds at vehicle speeds of up to 50 km/h (31.1 mph).